After the sad fiasco of the Old Vic’s geriatric Much Ado About Nothing, it is a relief, as well as a pleasure, to report that this new production of a rarely performed early work by Turgenev is first rate, often wonderfully funny, and by the end deeply touching. The play – written in 1848 – strikes me as an unjustly neglected classic of Russian drama which has echoes of Gogol and at times seems to anticipate both Chekhov and Gorky. There is that familiar, strangely addictive mixture of melancholy and absurdity about the piece, and it springs surprises until the very end. The action is set on a vast provincial estate which, in the vivid opening scene, seems to be waking up from a long sleep. After years away from her home, Olga Petrovna, the young mistress of the estate is returning from St Petersburg with her new husband Yeletsky, a government official. Lucy Bailey’s beautifully fresh, observant production, in a fine translation by Mike Poulton, brilliantly captures the rush and bustle of the servants as they prepare to meet their mistress, heralded by a hilariously wheezy, out-of-tune brass band. One man, however, has particular cause to worry about the arrival. Kuzovkin (Iain Glen) has been living in the great house for 30 years, one of those impoverished hangers-on so commonly found in Chekhov. In the opening scene we see that he is reduced to sleeping on the top shelf of the linen cupboard, from which he descends with both agility and surprising dignity. Although he claims Olga Petrovna loves him, his future seems scarily precarious. He may be a gentleman but he is penniless, having spent all his money on a never-ending court case. But things seem to be going well. The new master invites him to an all-male luncheon and seems a decent chap. But then his nemesis arrives. At first Richard McCabe, who plays a neighbouring landowner, Tropatchov, merely seems an absurd fop, with his babble of slanderous gossip, corrupt face and epicene manner. But McCabe, once a brilliant Iago, leaves no doubt that we are in the presence of a character of vicious malignity. Chortling merrily, he takes odious pleasure in humiliating Kuzovkin and getting him drunk with endless toasts. Goaded beyond endurance, this baited bear of a man roars out the one great secret of his life – a secret that seems certain to destroy both his own happiness and those of others about him. It’s an electrifying scene, at once funny and almost too painful to watch, and the double act between the slimy McCabe and the tormented, drink-befuddled Glen is some of the most exciting acting I have seen on stage this year. 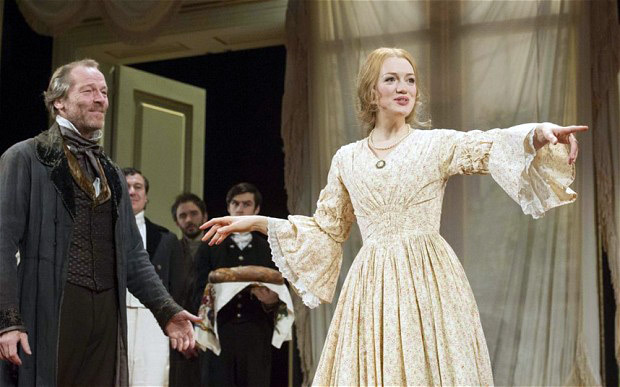 The second half is just as fine, less explosively theatrical to be sure, but instead full of deeper feeling, satisfying plotting and a lovely moment of honesty and tenderness between Glen and the confused young mistress of the house (a touching Lucy Briggs-Owen). William Dudley’s designs are sumptuous and atmospheric, and Bailey’s production beautifully captures the play’s rich variety of mood and tone. It’s great to find the Old Vic back at the top of it’s game. Iain Glen seems to be cornering the market in the Russian repertory. He was last seen on the boards as a moulting heart-breaker, allergic to commitment, in Longing, William Boyd’s conflation of two Chekhov stories. Before that he was a brilliantly volatile Vanya for Lucy Bailey. 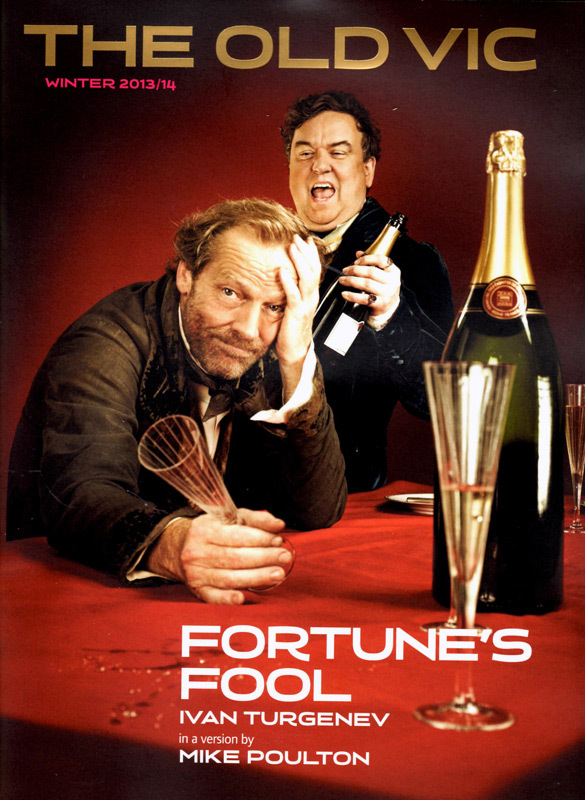 Now he teams up with Bailey again for this splendid revival of Fortune’s Fool (1848) – also known as The Parasite – an early tragicomedy by Turgenev. Mike Poulton’s canny adaptation was first staged at Chichester in 1996 starring Alan Bates who later took it to Broadway where it garnered a Tony nomination for Best Play. But this is the London premiere and I am delighted to report that that Bailey’s production, which is horribly funny and deeply touching, marks an impressive return to form by the Old Vic after the sad miscalculation of the recent Much Ado About Nothing. Glen is superb here as Kuzovkin, one of those impoverished gentlemanly hangers-on who seem to have been as staple a feature of the Russian country estate as silver birches and samovars. Having outlived the master who used to treat him as court jester, he simply stayed put – sleeping on the top shelf of the linen cupboard. But now Olga Petrovna (Lucy Briggs-Owen), the daughter of the household, is about to return after seven years with a polished St Petersburg husband (Alexander Vlahos) who is eager to take command. Will her remembered fondness for him save our hero from eviction? The future looks promising until Kuzovkin meets his nemesis in the fat, effete shape of Tropatchov, a sadistic fop (sublimely well-portrayed by Richard McCabe) who delights in humiliating people he considers socially inferior. At a lunch party on the first day, this smirking bully gets Kuzovnik drunk by forcing him to quaff endless toasts and he eggs him on to tell the ludicrously convoluted story of how his family cheated him of his wealth. It’s a merciless ritual that escalates chillingly here and ends with Kuzovkin,in a dunce’s crown and driven beyond endurance, retaliating with a shocking revelation. The rest of the play deals with the repercussions of that outburst. 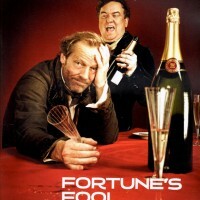 Filled with strong echoes of Gogol and with premonitions of Chekhov, Fortune’s Fool also shifts shift from the grotesque comedy of the first act to the heart-tugging melodrama of the second. 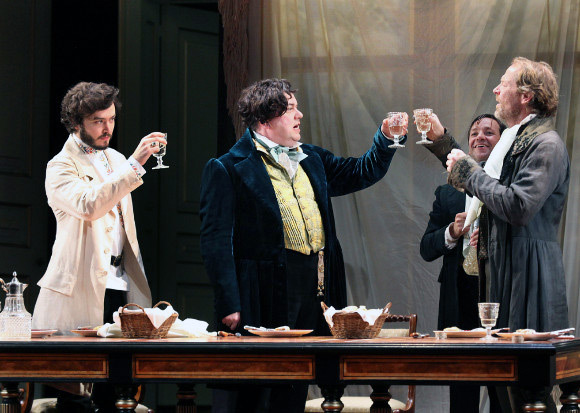 In Bailey’s beautifully considered production, though, there isn’t a jolting switch of tone and this brought home to me how the preoccupation that persists throughout is the rather Dickensian question of what constitutes a real gentleman. Glen shows you a shabby ineffectual dreamer who struggles to keep his head held high but whose sensitivity of spirit has not coarsened. He even manages, in a lovely absurd touch at the start, to descend from the linen cupboard with a certain dignity. In their wrenching scenes together, Lucy Briggs-Owen’s Olga piercingly conveys her recognition of his worth, unlike her spineless spouse whose offer of hush money results in one of the most ambiguous and painful happy endings on record. Iain Glen plays the more sympathetic, put-upon Kuzovkin with comparable skill. At first one is tempted to think of the character as a bit of a wimp for adopting the role of fortune’s fool. But Glen shows that Kuzovkin, like so many figures in Russian drama, is comic outside and tragic within; in the second act, he grows into a figure of genuine moral stature. It is rare to come out of the theatre with a pressing sense that one would like nothing better than to see the same production again and as soon as possible. Thanks to director Lucy Bailey, one is persuaded that Turgenev’s seldom-performed Fortune’s Fool (1848) is a little masterpiece. It’s a play that, if not quite equal to any by Chekhov, comes pretty close. Turgenev has the Russian gift for the tragicomic, the steadfast refusal to simplify the psyche or to polarise good and evil – life is allowed to be a painful muddle. Fortune’s Fool opens with the sight of a colossal linen cupboard and maids busying themselves with its lower shelves. It’s not until he stirs that we notice the man who has been sleeping inside the cupboard all along, on the top shelf. This is Iain Glen’s Kuzovkin, the fool of the title, a figure whose threadbare, sparrow-brown clothes and far-fetched existence, surviving on charity on a country estate, do not obscure his sympathetic gallantry. It is affectingly clear that he’s a gentleman. Glen’s performance is perfect: his glamour wonderfully illuminates his character in moments of uprightness and humiliation alike. He wakes from his linen cupboard to a household in uproar: the newlywed lady of the house is about to return with her husband, now the estate’s master. There is exquisite ensemble work as the handsome country house (designed by the inimitable William Dudley) comes to life with much rushed, and often inefficient, industry. Dustsheets are whipped off, a giant chandelier is tenderly unwrapped, a gold samovar is steered into place. And when the happy couple are within sight, the house is beside itself: I have never seen better dramatisation – or choreographing – of the panic before a party. The self-important steward (entertaining Daniel Cerqueira) is at pains to remove Kuzovkin and his bashful, doleful, chess-playing companion Ivanov (the excellent John McAndrew) from the premises. Their presence is seen to be a blemish. One assumes trouble lies ahead for Kuzovkin – and it does. But it doesn’t come in a form one could have predicted. The happy couple are more sympathetic than a lesser writer would have allowed (and Mike Poulton’s new version of the play is nuanced and compelling). Lucy Briggs-Owen’s Olga is light and pretty as thistledown but has the ballast of being an intelligent, loving woman too – it’s a beautiful performance. She apologises for her husband, saying he appears “cold” but explaining that he is not. Alexander Vlahos’s Yeletsky is masterly and subtle: a pale, pensive, fastidious presence, a control freak about the estate’s accounts but not a man without heart. In Turgenev’s hands, people are as difficult to pin down as they are in life. Yeletsky can also seem absurd, a toy husband, ready to stamp his little feet in their silly knee-high patent riding boots. Meanwhile, there is a wonderful contrast between Olga’s flyaway ardour – she dances through the house like a summer breeze – and the servants, an awkwardly parked group, paying their respects in the doorway. The newlyweds have scarcely settled before the unwelcome arrival of a startling neighbour: Tropatchov (Richard McCabe). He resembles a marooned opera singer who, in lieu of an aria, cannot stop talking. He wears a grassy velvet frock coat, is noisily camp and frequently breaks into impromptu Italian. He has a peculiar, stunted sidekick (the priceless Richard Henders) whom he does not permit to speak and dubs “Little Fish”. McCabe’s performance is magnificent: calculatedly over the top, disagreeably compelling, brilliantly vicious. This is a man who helps himself to lilies from one of the house’s vases and shreds them to decorate himself with a spectacular buttonhole. And it’s not just the lilies that suffer. Kuzovkin is about to be shredded too. It would be a spoiler to say more – except to hint at more than a skeleton in Kuzovkin’s linen cupboard. One leaves the theatre moved, entertained and confounded – all at once – and, in the absence of a sequel by Turgenev (which would have been best of all), feeling that imperative to return. 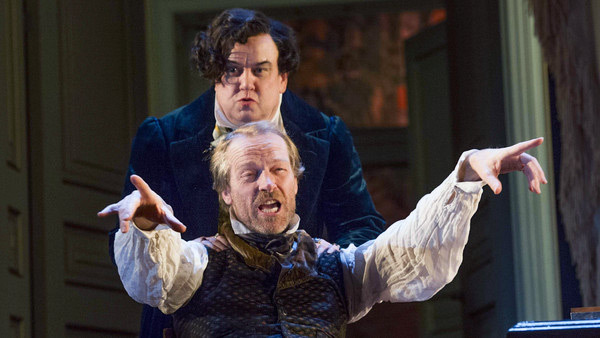 Iain Glen is utterly magnetic, at once dignified and embarrassingly diffident as Kuzovkin. His lengthy, sozzled account of a complicated legal case is a virtuoso piece in itself and makes the required transition from entertaining absurdity to grotesque torture. 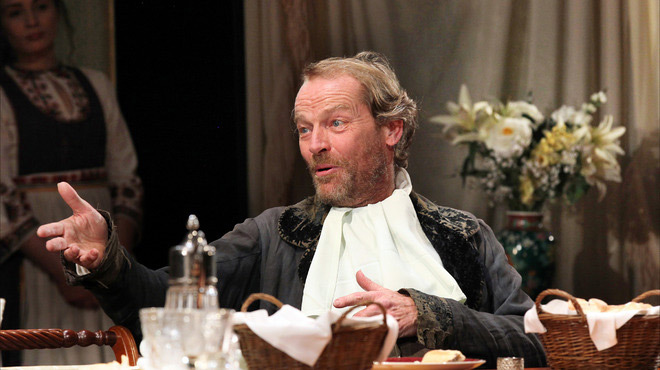 Iain Glen is utterly magnetic, at once dignified and embarrassingly diffident as Kuzovkin.